I apologize for being gone so long. It started with going back to college, and then a promotion for my husband and a moving adventure, settling in to the new place and keeping grades up in school, and ended with Stage 3C Uterine cancer, surgery, chemo, and many doctor visits to come. While I am out of school, I am going to try to get back into scrap booking and digital art. Now I am not guaranteeing that it will be any good, but I will give it my best shot. Total Disorder Blog Train Coming Your Way! Total Disorder Blog Train is leaving the station on September 1, 2009! Come along for the ride and experience great kits! Come get this collaboration for $2.50 It contains 82 Papers, 136 Elements and 4 photos!! Come let us advertise for you on our Topsites!!!! This is called Oh Good Goth! all full sized at 300dpi. It's on sale at Country Style Designs. 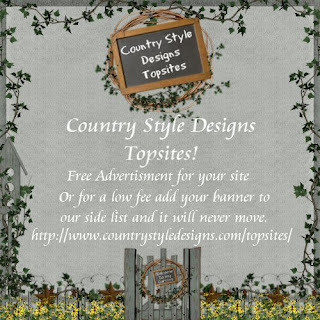 COUNTRY STYLE DESIGNS STORE COLLAB HERE!!!!!!!!!!! 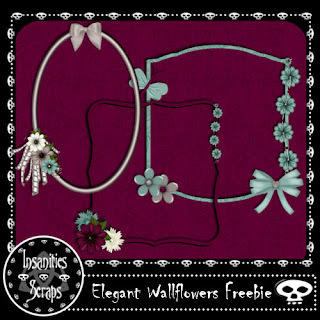 Here's the Freebie that goes with Elegant Wallflowers Kit. WARNING - This music may offend someone's sense and sensibilities, which is why i have it situated to be played only on command.